Platelet-rich fibrin (PRF) concentrate was developed in France in 2001 by Choukroun et al. Initially known in its platelet gel form, it can also be used as a membrane, being widely used to accelerate the healing of soft and hard tissues. The aims of this study are to report the applicability of platelet-rich fibrin in dental practice, seeking evidences of benefits in the regeneration and healing process of both soft and hard tissue. For this, a bibliographic survey of articles published between 2007 and 2017 was carried out using the descriptors: “Platelet-rich fibrin,” “oral surgery,” “fibrin” and “growth factors,” during the month of December 2017 resulting in nine selected articles according to the preestablished inclusion criteria. The results of the studies either showed that PRF presents effective and safe use when used in combination with biomaterials or isolated, in addition to presenting low risk associated with satisfactory clinical results. PRF consists of a fibrin matrix polymerized in a tetramolecular structure that incorporates platelets, leukocytes, cytokines, and circulating stem cells. Slow fibrin polymerization, during PRF processing, leads to the intrinsic incorporation of platelet cytokines and glycan chains in the fibrin meshes. This result implies that PRF, unlike the other platelet concentrates, would be able to progressively release cytokines during fibrin matrix remodeling process. Studies show several benefits in using PRF. The concentrate can be used in platelet gel form, as a membrane and can also be used in a liquid (injectable) form, for this, the tubes used for blood collection should not contain additives, allowing the PRF to be obtained its liquid form ,, [Table 1]. PRF releases a number of growth factors. Among them, we can mention the transforming growth factor-beta, platelet-derived growth factor, vascular endothelial growth factor, and matrix glycoproteins (such as thrombospondin-1) that are gradually released at least for 1 week. The increased concentration of these growth factors suggests an acceleration in the healing of soft and hard tissues. In addition, several studies have suggested that PRF may stimulate osseous and soft-tissue regeneration while also reducing inflammation, pain, and unwanted side effects. This study aims to critically discuss the applicability of platelet-rich fibrin in dental practice, emphasizing its benefits in the regeneration and healing process of soft and hard tissue. The present study was prepared from a bibliographic research by digital means during December 2017. The following databases were used: BVS, SCOPUS, SciELO, LILACS, and MEDLINE/PubMed. For this, the keywords “Platelet-Rich Fibrin,” “oral surgery,” “fibrin concentrate,” and “growth factors” were selected, following the inclusion/exclusion criteria [Table 2]. Initially, 245 articles were found in the preestablished databases. The first evaluation resulted in the selection of 11 full-text articles. After careful reading, three of them were excluded. 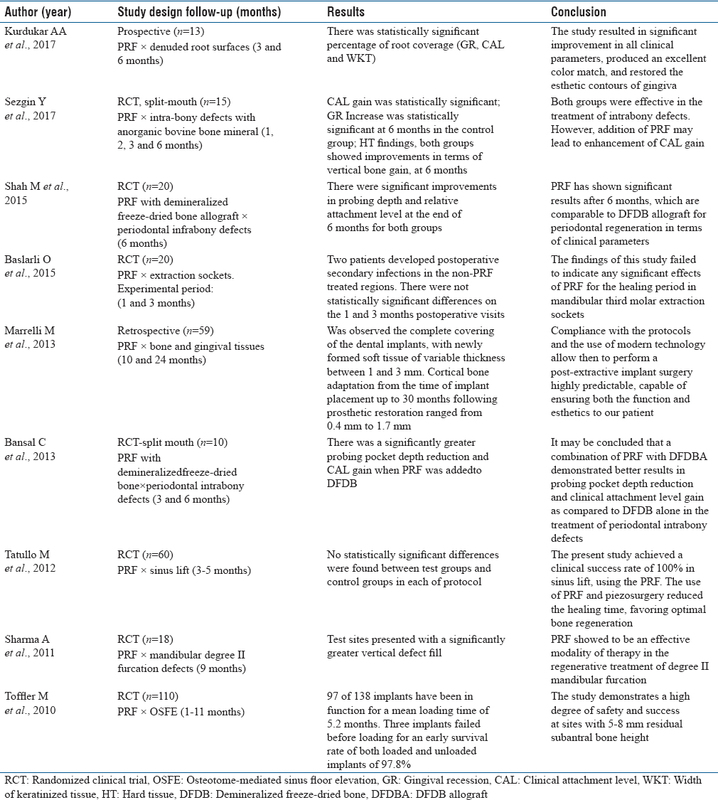 Thus, nine studies published were included in this review [Table 3]. In dentistry, PRF has been used as a treatment for gingival recession, furcation defects, maxillary rehabilitation before implant placement, restoration of peri-implant defects, as well as healing the tooth socket after extraction. PRF can regulate inflammation process and stimulate the immune response through chemotaxis., It can be used as unaltered mass, that is, as a clot or can be compressed into membrane without losing its properties. In their study, Toffler et al. showed that, in conducting osteotomy-mediated sinus floor elevation using PRF, wound healing was faster, predictably increased maxillary sinus elevation and in the case of perforation, the fibrin matrix may assist in healing the wound. This study presented favorable results regarding the use of PRF for this type of procedure, with a high degree of safety and predictability. In addition, the PRF membrane, or plug, also provides protection for the sinus membrane during the use of an osteotome and in case of perforation, the fibrin matrix may assist in wound closure. Another study that evaluated the use of PRF associated with bovine bone graft as grafting materials in sinus lifts concluded that PRF reduced the healing time, favoring optimal bone regeneration. In addition, platelet-rich fibrin has a gelatinous consistency that favors clot stability and when in the membranous shape, allows creating a natural “barrier effect” on the bone breaches that were opened in the surgical areas. PRF has also shown to be an effective modality in the regenerative treatment of degree II furcation defect. Sharma and Pradeep observed that there was greater reduction in probing depth, more relative vertical clinical attachment level and also relative horizontal clinical attachment level gain with significant bone defect filled with PRF in the treatment of degree II mandibular furcation defects. In relation to periodontal regeneration in infrabony defects, demineralized freeze-dried bone allograft is still widely used. However, PRF showed promising results for periodontal regeneration in terms of clinical parameters and is comparable to demineralized freeze-dried bone allograft. Shah et al. showed that there is no difference in the clinical parameters between the PRF group and demineralized freeze-dried bone allograft group in periodontal infrabony defects in the experimental period of 6 months. Two positive results were also observed when associating the PRF to demineralized freeze-dried bone allograft. One study evaluated there was a significantly greater probing pocket depth reduction and clinical attachment gain. In agreement with this result, another study indicates that both PRF associated with anorganic bovine bone mineral and anorganic bovine bone mineral are effective in the treatment of intrabony defects. However, the addition of PRF to anorganic bovine bone mineral may lead to increased level of clinical binding gain. PRF offers several advantages when used in conjunction with bone grafts including promoting wound healing, bone growth and maturation, graft stabilization, wound sealing, hemostasis, and also improving the handling properties of graft materials. There are several advantages of using PRF, such as easy and simplified chairside preparation of PRF, cost-effectiveness, release of relatively constant concentration of growth factors over a period of 7 days and also rapid and excellent healing of the periodontium. This natural material actually seems to accelerate the physiological wound healing, besides, in association with bone grafts, it seems to accelerate new bone formation. In the last years, PRF concentrates have been widely used as a supplement to tissue regeneration procedures. The results of the studies showed that PRF presents effective and safe use either when combined with biomaterials or isolates, besides presenting low risk associated with satisfactory clinical results. PRF has proven to be very advantageous for use in dentistry since most studies suggest benefits in the process of regeneration and healing of soft and hard tissue. Choukroun J, Adda F, Schoeffler C, Vervelle A. Un opportunité in paro-implantologie: Le PRF. Implantodontie 2001;42:55. Kurdukar AA, Kurdukar PA, Dani NH. Modified lateral positioned flap with platelet-rich fibrin graft for treatment of denuded root surfaces: A clinical study. Indian J Dent Res 2017;28:524-9. Shah M, Patel J, Dave D, Shah S. Comparative evaluation of platelet-rich fibrin with demineralized freeze-dried bone allograft in periodontal infrabony defects: A randomized Controlled Clinical Study. Journal of Indian Society of Periodontology 2015;19:56-60. Baslarli O, Tumer C, Ugur O, Vatankulu B. Evaluation of osteoblastic activity in extraction sockets treated with platelet-rich fibrin. Med Oral Patol Oral Cir Bucal 2015;20:111-6. Sharma A, Pradeep AR. Autologous platelet-rich fibrin in the treatmentt of mandibular degree II furcation defects: A randomized clinical trial. J Periodontol 2011;82:1396-1403. Mourão C, Valiense H, Mourão N, Maia M. Obtention of injectable platelets rich-fibrin (i-PRF) and its polymerization with bone graft. Rev Col Bras Cir 2015;42:421-3. Borie E, Oliví DG, Orsi IA, Garlet K, Weber B, Beltrán V, et al. Platelet-rich fibrin application in dentistry: A literature review. International Journal of Clinical and Experimental Medicine 2015;8:7922-9. Sezgin Y, Uraz A, Taner IL, Çulhaoglu R. Effects of platelet-rich fibrin on healing of intra-bony defects treated with anorganic bovine bone mineral. Braz Oral Res 2017;31:e15. Marrelli M, Tatullo M. Influence of PRF in the healing of bone and gingival tissues. Clinical and histological evaluations. European Review for Medical and Pharmacological Sciences 2013;17:1958-62. Toffler M, Toscano N, Holtzclaw D. Osteotome-mediated sinus floor elevation using only platelet-rich fibrin: An early report on 110 patients. Implant Dentistry 2010;19:447-56. Tatullo M, Marrelli M, Cassetta M, Pacifici A, Stefanelli LV, Scacco S, et al. 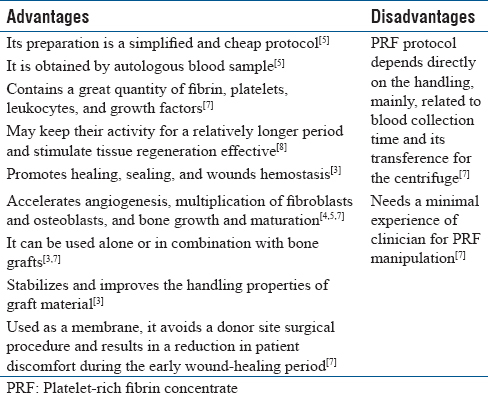 Platelet Rich Fibrin (P.R.F.) in Reconstructive Surgery of Atrophied Maxillary Bones: Clinical and Histological Evaluations. International Journal of Medical Sciences 2012;9:872-80. Bansal C, Bharti V. Evaluation of efficacy of autologous platelet-rich fibrin with demineralized-freeze dried bone allograft in the treatment of periodontal intrabony defects. Journal of Indian Society of Periodontology 2013;17:361-6.